Here you can purchase Rapid Fire Controller for the PS3 - PS2 - PC (NEW). Free UK Delivery on all orders. Wireless control pad for use with all PS3, PS2, PC consoles. Fully rechargeable with its integrated high capacity lithium ion battery. You can be sure that you'll have hours of gameplay with just one charge. Will connect instantly to your PlayStation 3 and PlayStation 2, no extra software required. In order to charge the control pad you will need to connect to your console with a standard Mini USB cable (supplied). The ultimate in gamer flexibility, precision, control, quality, and comfort are all yours. Made from toughened ABS plastic, you can be sure that this wireless control pad for your PS3, PS2, PC will last long for as long as the life of your console and beyond. 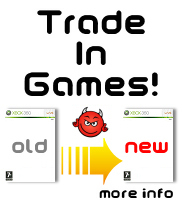 The game demon is a quality supplier of wii games, nintendo ds games, xbox 360 games, playstation 3 games, psp games, playstation 2 games, uk, console games, online, sale.